We left Rastatt with a good plan for reaching Leimersheim tonight. We made a note that there were a couple of highlighted "dekes" near Karlsruhe before we cross the bridge to the west side of the Rhine. When we got close, I said to Brent that we had to be careful not to accidentally take the side route into Karlsruhe itself - we're bypassing, not going all the way into the city. Ironically, when we got to Rheinhafen-Dampfkaftwerk, we missed a corner and accidentally started heading into Karlsruhe. Before getting too deep into town, we stopped to contemplate where we were and where we'd screwed up. We were standing outside a hotel, and after a few minutes, the nice hotelier came out and told us where to go. I mean, he told us where to go, not he "told us where to go". 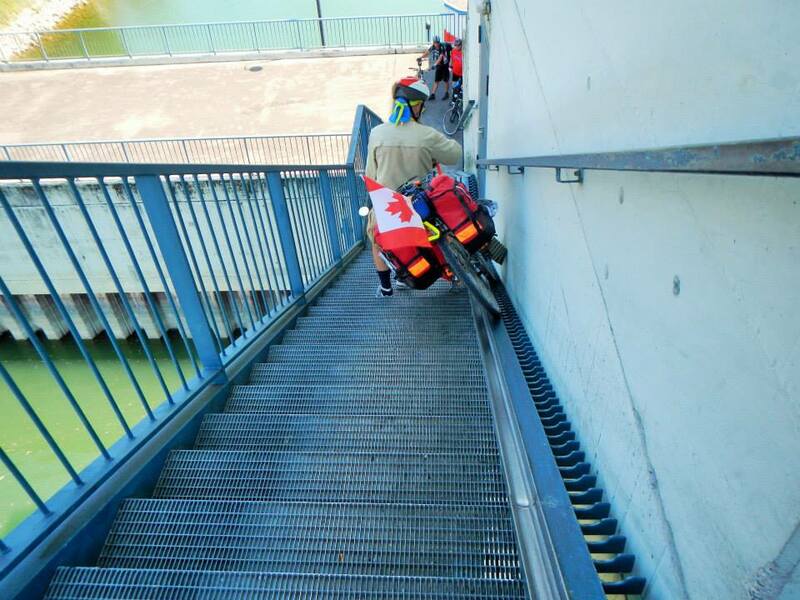 He mentioned that when we crossed the bridge over the small channel near the factory that there were steep stairs up and down, but the route was much more direct. After getting directions back to where we had missed a turn, we returned to Rheinhafen-Dampfkaftwerk and found the bridge over the channel. Oh my... yes, indeed, there were steeps stairs up and down. If Brent hadn't done most of my work for me, I would have had to unpack all of my paniers and make three trips up, then three trips down, to get my bike and luggage up, and then down. When we started riding the Rhine, Strasbourg, France, was on one side of the Rhine, and Kehl, Germany was on the other. 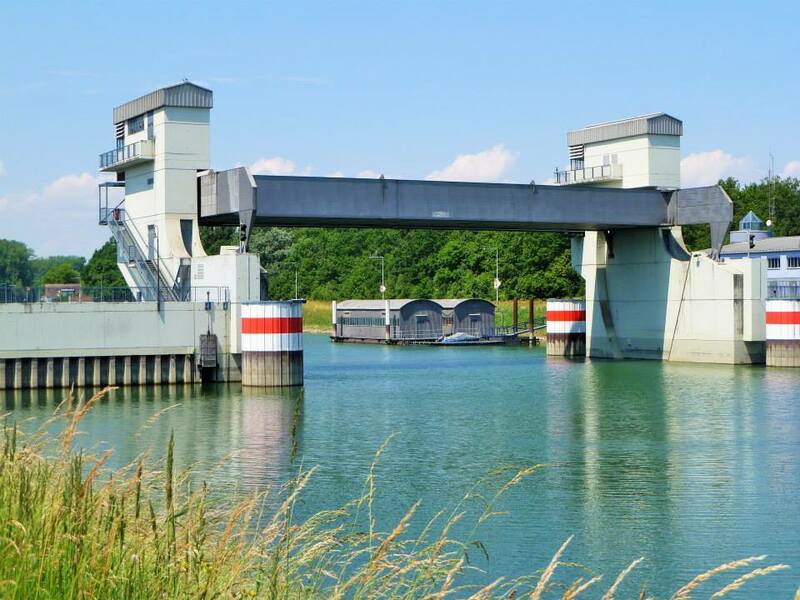 We assumed that the Rhine formed a natural border, and that on one side, you were in France (in spite of the German town names), and on the other side, you were in Germany. A couple of people had even said that to us... if we wanted to speak French, we just had to cross the river. We crossed to the west side of the Rhine today because that was the only defined route. We really wanted to stay in Germany, but this was a necessary detour. When we got to the other side... everything was still German. When we got further and further into the other side... everything was still German. Close inspection of one of our maps showed that the Rhine isn't actually the border in most places and Germany spills further west than we thought. We're still in Germany, and we're planning on staying on the west side of the river as much as possible now. There are just way more amenities over here. 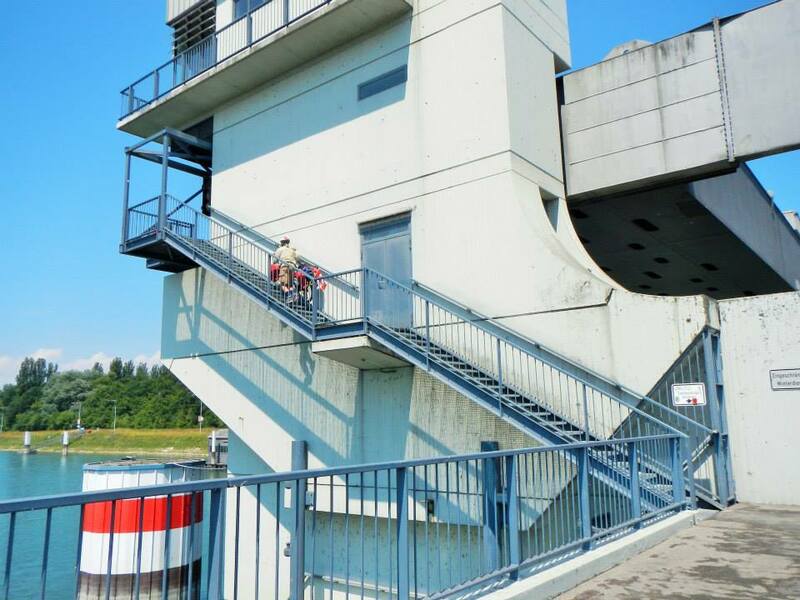 Our plan for the day was to cycle as far as Leimersheim and then, tomorrow, cross on the ferry back to the east side. That was before we discovered that a lot of the west side of the Rhine is still Germany. Anyway, when we got to Worth am Rhein, we decided to take a side route instead of staying along the Rhein and enjoy going through some small towns on our way to Leimersheim. We'd be passing through Jockgrim, Rheinzabern and Neupotz. Jockgrim seemed to have some places to stay, but that was too soon to stop. Rheinzabern had nothing. Neupotz had what looked to be Pensions, but they were not open yet, and I wasn't into chasing someone down at their home to inquire. So, we continued on to Leimersheim. It's a really nice little town, but small. We found one guesthouse, but the proprietor advised that they were full and there was no other place in Leimersheim to stay. We'd have to return to Neupotz and look for a Pension. Since that meant backtracking (and I hate backtracking), we opted instead to head for the ferry. If we could still cross that night, we'd cross and then look for a place to random camp, otherwise we'd try to random camp near the ferry. On the way to the ferry, we cycled on a pathway in between Leimersheim and the Rhein. We were beside a dike, and on the other side was a small forest. Unless someone deliberately climbed up the dike, they'd never see us camping in the small forest. It looked perfect, really. We just had to find a good spot to "hide". We decided that it was probably the best option we'd find for random camping, so we deked around the dike and started down the small "channel" between the dike and the forest, looking for the right spot. The lower ground was very wet (that should have provided a warning, but it didn't), so we went until we found a nice spot which was a little higher, and in a nice divot in the forest, for good hiding. We decided we'd found the perfect random camping site and jumped off our bikes. At the same moment, all the mosquitoes in the world decided that they'd found the perfect meal and landed on us. By then I was pretty weary - physically and mentally - and I didn't want to go on, so we decided to tough it out. You have never seen two people set up camp so quickly. We set up the camp, then tossed most of our full paniers into the tent. Brent took one for the team and stayed outside to attach pegs and the fly, while I leaped into the tent to set up inside (including killing the mosquitoes which had followed us in). When the fly was done, Brent lept into the tent and we continued to set up and arrange our stuff (we don't usually have every single thing in the tent with us). It was stinkin' hot - it has been over 30C that day, and... uh-oh... the doors on the fly were closed. We'd opened the screens on the tent itself, but the fly was turning us into an oven. It was my turn to take one for the team. I decided I was going to put a "haz mat" suit on (my shell jacket, with hood up and cinched around my face, plus my rain pants), leap out of the tent (Brent would zip the door behind me), and open and secure the fly door on my side, then run around, open and secure the fly door on Brent's side, then leap back into the tent (with Brent unzipping and zipping the door behind me). With that operation taken care of, we were much more comfortable, but we were still faced with spending the evening hiding in the tent from the mosquitoes. 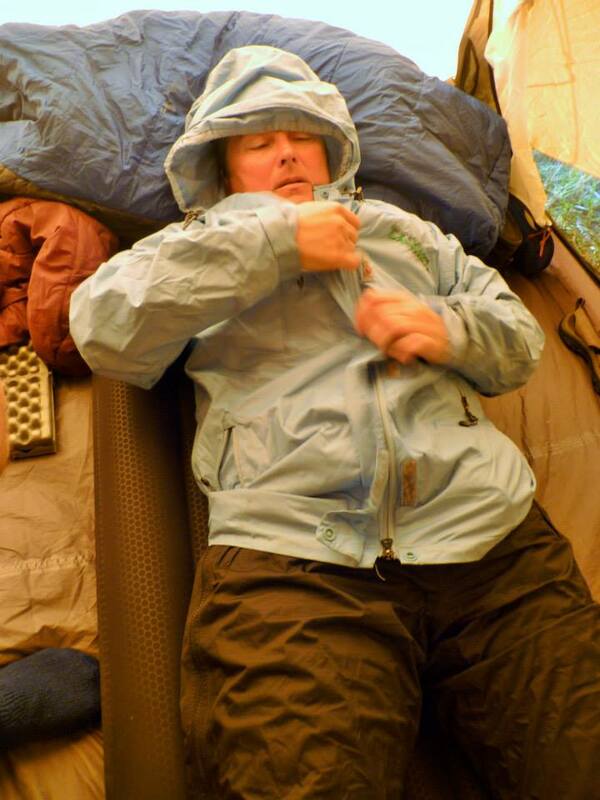 Donning my haz mat suit inside the 40 degree tent so I can brave the mosquitoes and cinch open our tent fly doors.